both designs are awesome, imo. Not sure if the rules have been changed by the staff, but whatever. 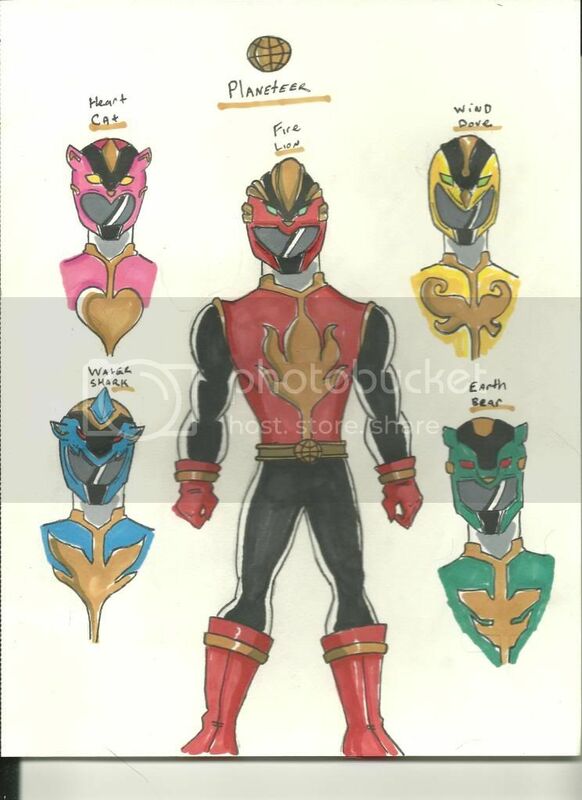 I have no idea what that first one is, but looks like an awesome space sentai suit. 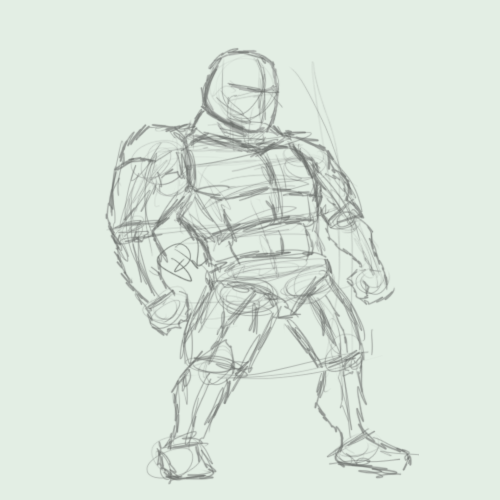 me either, I sorta just draw to draw, so most of the time it is just a generic sentai something or other. I don't really have a theme in mind. Sahara William is a worker a seaside taco stand in Hawaii. One day, she was working at the stand on a lazy Sunday evening when she noticed an sea turtle wash up onto the shore. Sahara quickly went to the turtle and called a veterinary clinic nearby. The taco stand-worker could help but feel a lot for the creature, strange burns covered him and it hurt Sahara. The next day she went back to work and walked the beach were she found the sea turtle, she found glittering in the sand was a bright green turtle-shaped crystal. Sahara thought it must of fallen off a ship and then washed up on shore. She put it in her pocket and went on her way. Meanwhile, a large metaloid creature rose from the depths of the ocean seeking a rather familiar signal from the surface. This creature was in fact the Guardian of the Pacific ocean, the emerald sea turtle. She followed the gem's signal and found Sahara. 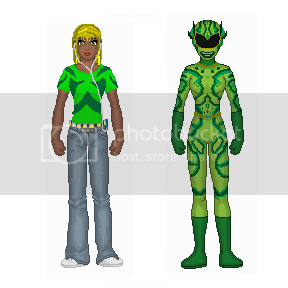 Sahara soon joined the other rangers and was known as the Green Shining Sea Ranger! That's really great... Dynamic pose, colors, I'm lovin' it! Thanks! It was just a doodle to show what I could come up with using the advice I gave budd20. Centuries ago, in the lush and beautiful land of Japan during the Feudal Era, the force of lawful good was represented in the form of the Samurai, an elite class of hereditary heroes-- born of prestige and bound by honor to serve under the guidance of their Daimyo and the greater Shogun in service of the Mikado and their country. One of the most legendary of all Samurai was Musashi Miyamoto, the original Sword-Saint of the Land of the Rising Sun. A tactical genius with a penchant for wearing the color red, Musashi was one of five legendary warriors chosen by the Mikado himself to receive an ancient power, derived from alchemical elements tied to the art of Japanese calligraphy, powerful alien magic, and from the very spirit of the land-- Nippon’s very essence itself. The other four members, Heihachi Hayashida ( a kind, loyal, but inexperienced warrior who most often wore blue), Kikuchiyo (A faux-Samurai who ascended to greatness by proving his prowess who is said to have favored dressing in green), Shino Okamoto (A rare female warrior, usually garbed in pink, from an aristocratic family who's grace and kindness are historically renowned), and Nakano Takeko (Another fearless female warrior defined by her strength and bravery, despite her fondness for dressing in yellow), were all chosen specifically for the cause because of their unique talents and embodiments of Japan’s undying soul. Derived from the secrets of the Morphing Masters, they become Shinkenger, brightly colored Samurai gifted with Kanji Powers, to fight against the terrors of the Netherworld* legions of demonic monsters known as The Accursed Oni Tribe who enter the living world through shadow. Upon the River of Sorrows, one of many fabled bodies of water separating the world of the living from that of the dead, there floats an ominous looking junk boat where there reside the members of The Accursed Oni Tribe (or simply, The Accursed), former warriors who succumbed to the dark side. This heinous group is made up of the wine-swilling leader and warlord Darkurse (pronounced Dahr-Curse), the evil beauty Fathma (FATH-ma), the calculating and humorous Calamarius (KAL-uh-MAR-ee-us), and their never-ending army of Cephelodrones (SEF-a-la-DRONES) and Accursed monsters from the depths of the River of Sorrows. The original Shinkengers defeated The Accursed centuries ago, Musashi himself banishing Darkurse with one final blow from his broadsword, Daizanto the Firebrand. Once The Accursed were locked away, the five Samurai promised an oath bound by ancient magic, guaranteeing that their fighting spirits lived on after their deaths in the form of Spiritual Successors* their future incarnations. In the present day, the threat of The Accursed rears its’ ugly head once more as the approaching of a rare planetary alignment unlocks the seals to the Netherworld, allowing the denizens of the River of Sorrows to wreak havoc on the earth in hopes of overflowing the banks and flooding the River into the human world so that they may enslave all mankind. Drake Miyamoto, direct descendant of the famed brave swordsman Musashi, has taken on the cause to protect the world from The Accursed. Raised by his godfather, sword maker Hanzō Hattori, Drake has trained since boyhood to become the Spiritual Successor to Musashi, the leader of the original Shinkenger squad. The first to realize his call to duty, it is up to Drake as leader to find and ‘activate’ the other four Rangers. Drake discovers that his spirit guide, the Origami Lion, wishes to lead him to Orchid Bay, California. There, he meets Kale Novak, Tamika Holiday, J.D. Gutierrez, and Paige Tennant. The quintet are instantly drawn to each other, and when Origami Lion finds his friends Origami Turtle, Origami Monkey, Origami Dragon, and Origami Bear, they all attach themselves to one of the four, signifying them as the Spiritual Successor of the most recent incarnation of the Shinkengers. 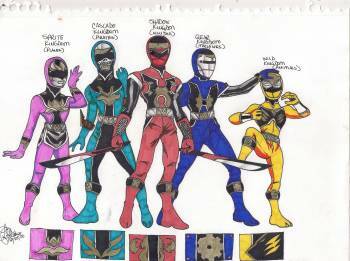 Now privy to their destiny and sworn to protect the world from the return of Darkurse and his forces, the new Shinkengers (who call themselves Rangers in the style of other such groups) dub themselves Bushido Blitz and take up the sword in the face of danger. Drake Miyamoto was born and raised primarily in his homeland of Japan. Kind, caring, and patient, Drake proves to be a born leader once he meets the rest of his team. His spirit animal, Origami Lion, is his best friend before meeting the other four Rangers, at which time Drake begins a quick camaraderie with the quartet, especially Kale. 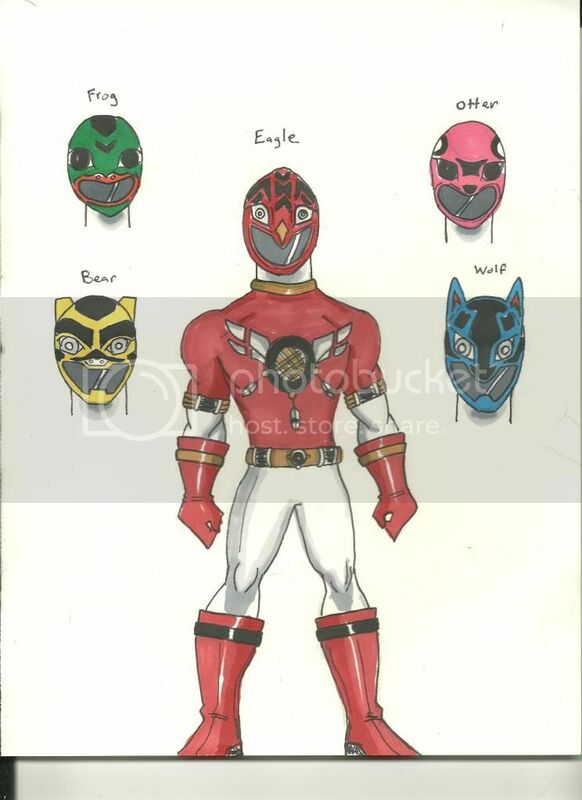 Spiritual Successor to Shinken Red, Drake is the leader of the team: Bushido Blitz Red Ranger. Kale Novak is a friendly, loyal, and determined young man who seems to be searching for his purpose in life. Dedicated to the craft of dance, Kale is shy and uncertain about where his true talents lie. Upon discovering his role as Spiritual Successor to Shinken Blue as the Bushido Blitz Blue Ranger, Kale throws himself headlong into the role and quickly becomes Drake’s right-hand-man and best friend. Tamika Holiday is a sporty, bubbly, and sweet young woman who aspires to live up to her family’s expectations of her. With her father as a police commissioner, her mother a choir teacher, and her older sister studying to be a lawyer, she has been searching for her own special thing. She has a natural ability to play woodwind instruments beautifully. Finding out that she is the Spiritual Successor to Shinken Yellow as the Bushido Blitz Yellow Ranger, Tamika finally believes her day has come to shine. Jonathan Dwayne “J.D” Gutierrez is a boisterous, happy-go-lucky young man who seems to just go with the flow most of the time. Deeper observation reveals J.D. to be confused about his future, having not decided a major to follow in college. Realizing his role as the Spiritual Successor to Shinken Green as the Bushido Blitz Green Ranger, J.D. decides to set his worries aside so that he may better serve and protect the world. Paige Tennant is a kindhearted Psychology major with a love of children and fashion. Smart but relateable, Paige has her goals set out in front of her before meeting Drake and the other three Rangers. Discovering that she is the Spiritual Successor to Shinken Pink as the Bushido Blitz Pink Ranger, Paige takes a look at the big picture and has begun questioning whether a career as an educator is what she really wants. When The Accursed’s forces get closer to discovering the secret of the Ultima Seal, a specific set of kanji characters that sealed their evil forces in the last major battle between The Accursed and the Shinkengers, the Bushido Blitz Rangers are pushed to their limit to keep the monsters from attaining the secret before they do. When they are overwhelmed by one of the stronger Accursed Oni from the depths of The River of Sorrows, they receive help in the guise of the Bushido Blitz Gold Ranger. Disappearing immediately after the battle is won, the Rangers begin to search for the mysterious Sixth Ranger. Where they find him is surprising. Raizo Ikeda would appear to be not much more than a talented hibachi chef, but he is actually much more. Descended from the line of the Mikado who originally empowered the first Shinkengers, Raizo has been raised to be proficient in most hand-to-hand and weapons combat techniques. Though he doesn’t know much more about the whereabouts of the Ultima Seal than his new teammates, Raizo provides a much needed assist as the Bushido Blitz Gold Ranger. Towards the end of the season, several questions arise that are later answered in the most spectacular of ways. Eventually, it comes about that the Rangers learn that the Ultima Seal isn’t a scroll or special talisman, but a person. That person just so happens to be the heretofore unknown twin sister of Bushido Red. As she was born after Drake, she is the true Spiritual Successor to Musashi, but because of her significance, her powers did not activate until they were needed* namely when Drake is nearly destroyed by Darkurse. Kaori Miyamoto is a vivacious young woman, who never knew her own strength until it was revealed to her, suddenly, by her guardian and trainer Tamoe. Kaori never understood what she was training for, but she knew that she felt emptiness in her heart that she couldn’t explain*as though she was missing something. That something happens to be her twin brother Drake, who she didn’t know existed until arriving in Orchid Bay once Tamoe receives word that they are needed. 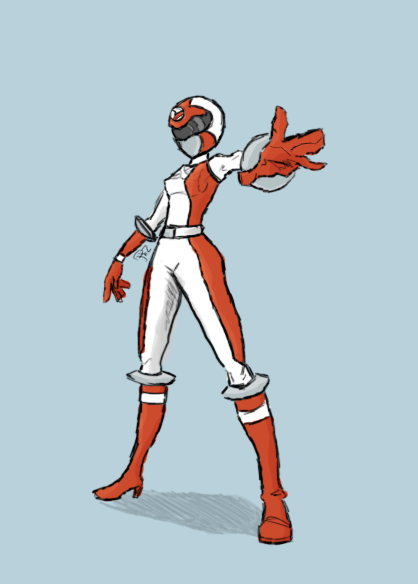 Though she doesn’t understand the full scope of her purpose, Kaori is steadfast and strong, determined to avenge her incapacitated brother as the second (and true) Bushido Blitz Red Ranger and seal away The Accursed Oni Tribe for another millennia. Nice budd20, and very cool TSFR. It's great that added on a story to your pixels. I hope you guys like it. I almost went crazy working on this one, I didn't know how I was going to pull it off lol. Sorry it took me so long! Cool man! I can't wait to see it! My entry for the most recent PG contest: Spawn! Film Noir, Werewolf, and Greco-Roman Spawns, in two variations. Everything here is my hard work. Please don't touch anything without permission. Thanks.